As a company, we committed to educate people on the money secrets that in the past have been only reserved for the wealthy. We then take a needs-based approach by analyzing their current plan to determine which concepts and products best fit their needs. Our goal is to help you create a plan that protects your family, minimizes the effects of taxation and market loss, all while building a strong nest egg to secure your financial future. Retiring America has a vast portfolio of concepts and products from some of the powerful product providers in the financial industry. 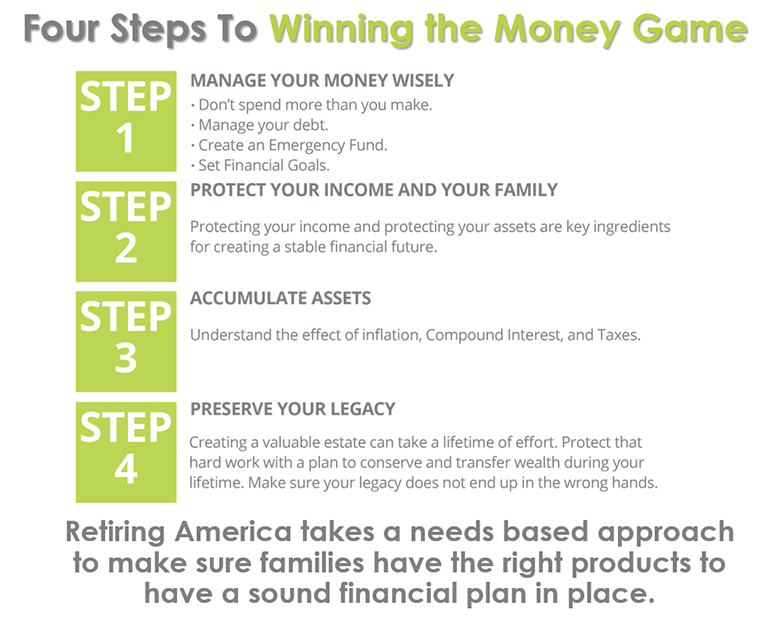 These products all fit in around the Retiring America Four Steps to Winning the Money Game. Get with your local Retiring America representative or contact us today to take that next step to building a strong financial future for your family!